It has been a long time that steam cleaners are in the market. They are amazing equipment, which not only helps you clean the smallest and biggest areas of your home, but also sanitize them. In fact, it will not be an overstatement to say that no other cleaning equipment can match the technology and results of steam cleaners. One of the widely accepted and preferred steam cleaners are those, which are referred as vapor steam cleaner. This equipment emits higher quantity of vapor and much hotter vapor than the traditional steam cleaners. The vapor emitted is dry and contains just about 5% of water. However, if you settle for low-priced and cheap quality steam cleaners, then the vapor might be on the wetter side as well as will not be comfortable to use in home or offices. Fortunately, steam cleaners of Vapamore are ideal for all home and offices. The cleaner works using the power of 220°F steam and comes with a variety of attachments, which can be used to clean all dust mite, bedbug, etc. All in all you can clean and sanitize even the most hard to reach spots and that too without using any sort of harmful chemicals. Besides, the steam cleaner of Vapamore is easy to move around. Its compact design doesn’t affect its efficiency nor is its steam pressure compromised. 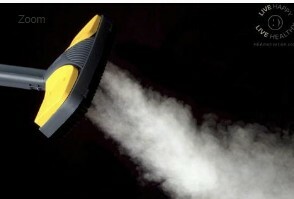 You want a simple, light weight and user-friendly steam cleaner which can be used on daily basis. You or your loved one is suffering from asthma or have any sort of allergy and which to clean and sanitize the house without using harsh chemicals. You want to clean your home without spending a lot of cleaning agents. · Bathroom: Steam cleaner will precisely remove all the soap scum from tub, shower, sink, floor, grout, etc. Besides, it will sanitize your bathroom and eradicate the growth of any mold, mildew, and bacteria. · Kitchen: By using a steam cleaner, you can easily clean and sanitize countertops, refrigerator interior and floors. Stains of grease, build-up on stoves, ovens and kitchen vents can also be cleaned easily. · Carpets and Upholstery: With the help of a steam cleaner, it is effortlessly possible to keep your carpets and upholstery spot less. It removes stains of spills and thereby kills germs effectively. Besides, you can also use it to make your bedding, mattresses and pillows dust free. · Entire house and office: There are certainly many such spots, which need thorough cleaning in our homes and offices. However, because of the lack of proper equipments, we cannot clean those spots. Vapor from steam cleaners easily reach these spots and thus make precise cleaning easier. There are many individuals around the globe who are satisfied with the working and results of Vapamore steam cleaners. If you are too looking to get on for yourself, it is recommended that you visit http://www.heamotivation.com/products/vapamore-mr-100-primo-steam-cleaner and go through the specifications of Vapamore steam cleaners in detail.